Web 2.0 was — and in many ways still is — a rather ambiguous term coined to represent a new design style, out-of-the-box ideas about user and community interaction, and the implementation of slick albeit already existing technologies to revolutionize Web user interfaces. Let's not forget tagging, folksonomies, AJAX, the wisdom of crowds, and so on. Web 2.0 is not a technology, it is a label that represents a group of technologies, design patterns, and ideals. In the same way, Web 3.0 is not a technology, but the labeling of a group (or groups) of technologies, design patterns, and new standards. I'm not the only one talking about this. Nova Spivack and Yihong Ding have both posted responses to Micthell's stance on Web 3.0. I agree with several of Yihong's points. While he appears to support the idea of a Web 3.0, he does not agree with the current idea of what Web 3.0 will be, nor does he think we can predict that at this point. As I said earlier, I don't like the idea of Web 3.0. I don't support arbitrary versioning of an ever-evolving network of nodes supported by an evolving set of standards and technologies. We never hit a version at any point in the Web. I entertain the versioning systems, don't get me wrong, it makes talking about the old era (Web 1.0) and the current era (Web 2.0) a lot easier. I just don't think we need to keep this versioning tradition going. "Please don't tie Web 3.0 tight to Semantic Web. Yes, please, as Gartner has disapproved." In that post he says the diagram illustrates his thinking at that time at his company Radar Networks. He also considers that path to be where they are headed. So being an advocate of Web versioning he naturally disagrees with what Mitchell has to say about Web 3.0. It's an interesting read, and he describe some great innovations. He's pretty passionate about Web 3.0. "People keep asking what Web 3.0 is. I think maybe when you've got an overlay of scalable vector graphics - everything rippling and folding and looking misty - on Web 2.0 and access to a semantic Web integrated across a huge space of data, you'll have access to an unbelievable data resource." His vision there isn't anything nearly like Nova's vision of Web 3.0, but Tim may have more to say on the topic. Web 3.0 seems to be just as ambiguous as Web 2.0, if not more so. Nova, Yihong, and I have rather different views of what should become of Web 3.0. Nova is a true advocate of Web 3.0 and has many ideas that express his vision. 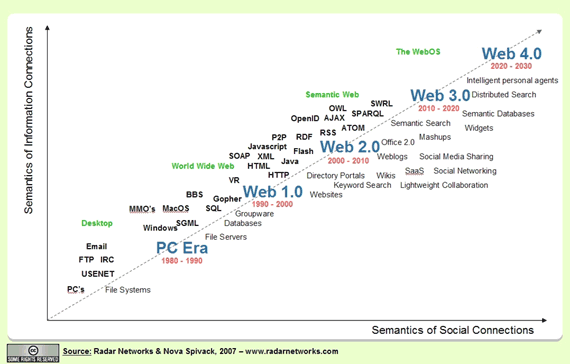 He also closely ties Web 3.0 to the Semantic Web. Yihong doesn't agree that Web 3.0 should be associated with the Semantic Web and has a few ideas of what Web 3.0 will be. I consider myself mostly undecided, but I won't say I support it. I don't support Web versioning. What do you think about Web 3.0?